You may remember those same vines looking so healthy and happy here and here. It is almost sad to see plants in the garden end their life cycle. Almost. But in this case, the dead vines mean yummy potatoes! I cannot say how long for sure, but the vines had completely died back at least a full week before we began to dig up the tubers. Which is a good thing. 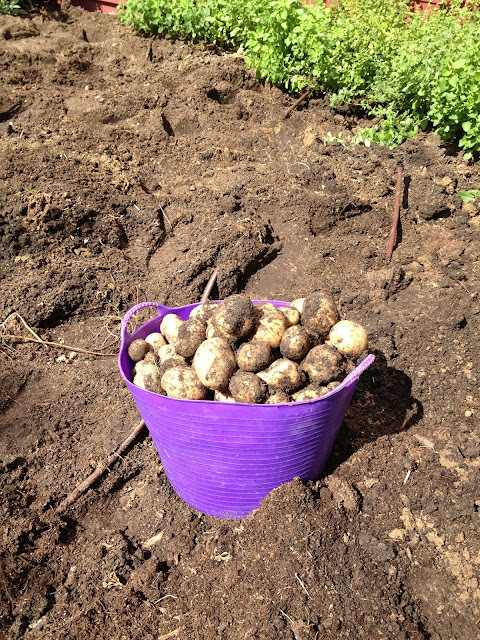 It gives the potatoes time to develop a thicker skin which will help them store longer. 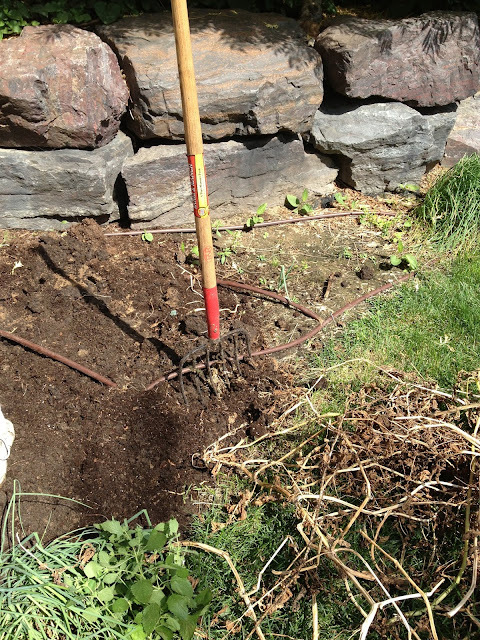 In order to dig up potatoes without damaging them it is helpful to have a big six tonged garden fork. The one pictured below is for hay but works great to get down below the potatoes and pop them out without stabbing them. We planted 5 pounds of Yukon Gold and 5 pounds of Norland Red. Our 10 pound planting resulted in a 100 pound return, pretty much 50 pounds of each (ok there were 3.2 pounds more of the Norland Red). After harvesting we washed them off. Now don't take that as gardening advice, because most experts recommend not washing them, but I just can't stand not to. Washing gave me a chance to take a real good look at the potatoes to sort through those damaged during harvest to be used first, those with varmint marks and other issues to be thrown away, and those to go into storage until needed. I am not sure what kind of varmint we had in the potatoes but a handful of them had gnawed areas showing a pair of long sharp teeth. They were probably voles but could have been mice. The potatoes for storage were placed in shallow cardboard boxes. I made a double layer of potatoes in the bottom of each box, with the top layer being rather sparse for good air circulation. The fille cardboard boxes were stored in the guest bedroom closet, which is a space completely underground, making it cool year round and it is so rarely used that it gets very little light. Potatoes need to be stored in the dark. I have never tried planting potatoes although I used to live in Idaho ;-) Enjoy those potatoes. I imagine they are much tastier than those purchased at the store. I am your newest follower. Stop by for a visit sometime. Welcome Susan and Bentley. I see you have moved down to God's country. My hubby and I are working to get back home in Texas ourselves. I wonder how much of my gardening experience here in the great frozen north will translate to zone something-warmer-than-here. What a great harvest! I tend to go out and dig up just one plant or two at a time as I need them for dinner, but the plan is to harvest the rest this weekend to try to can a few. I love when they have a great season and one tiny little potato magically turns into 10 potatoes. Thanks for sharing. Wow...what a harvest you have !! I totally amaze ! with 5 pounds you sow now you harvest 50 pounds !! Great job !! We do not put many in and usually just dig a few at a time to eat as we want them until the weather gets colder and hubs goes out and digs them up. My youngest daughter who lives in the city planted her potatoes in a barrel this year. Despite following the directions on line and my hubs telling her to wait until the plants start to die she still only got a hand full of potatoes. She got a laugh out of it but was still disappointed. 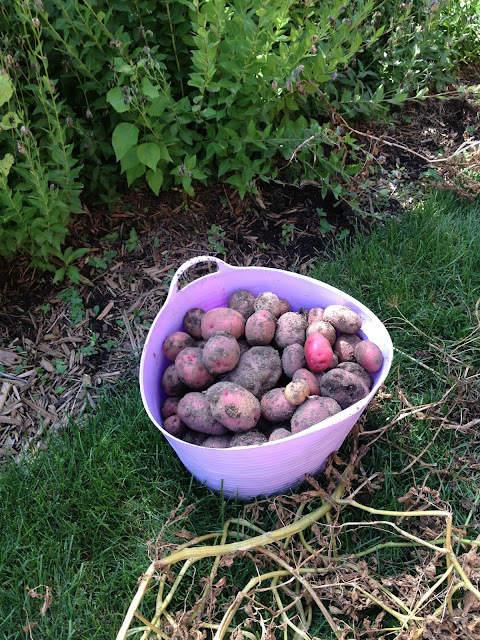 We are already looking for a place with a larger property so I can grow more...Especially potatoes! Thanks so much for sharing at Tuesdays with a Twist. I had never thought of grubs. We found exactly two of those nasty critters while digging up the potatoes. I thought they preferred grass roots. Learned something new! Thanks for stopping by. Hi Widgy Cat! That is some really rich dirt! Do you have a post on how you made your potato bed? It looks so nice! I can hardly wait to plant potatoes now! And thanks for the hash-brown recipe! I'm excited to try it! Have a great day! Blessings from Bama! Hi Felecia. No I don't have a post on the making of the potato bed. We used a LOT of compost (probably 3 or 4 cubic yards from our composters). We also came into several 3 cubic foot bags of organic potting mix (through my hubby's work) so will tilled that in as well. Soil amendments over a number of years make for a really rich and lightweight bed. Let me know how the hash browns go. I have be really happy with the results each time I have made these. Even my picky eater will eat them. Have a great day!